Do you remember when I wrote about planting hostas back in June of 2008? Well, take a look at how those hostas have grown. There are plenty more around the house in various locations, but those we planted by this old, quaint but out-of-use back porch came in with gusto this year. Since planting them, I have often seen other folks’ hostas, some quite huge and lush and longed for ours to attain such grandeur. Imagine my delight when I looked outside one morning after many days of rain and saw how wonderful abundant our hosta display had become. This year I have also planted a bunch of annuals in various old, rusty containers I bought at a nearby junk — er, I mean collectibles — shop last year. We are getting ready for the second annual Artists of The Oak Art Trail event (Saturday, August 27th this year) and I wanted to have plenty of charming flower containers to use dress the farm the day of the event. For now, they live on the old porch, keeping good company with our lovely hostas. We are excited about the Art Trail event, because last year’s event was such a beautiful day and this year is bound to be even better. Artists of The Oak is a group of artists from our county (Orleans County New York) that started forming up a couple of years back. My main primary contribution to the group, other than being an artist member, is to be the point person for the Art Trail event and try to do every thing I can to make it more and more successful. Last year I took up a collection for prints costs and designed a rack card to advertise the group and the 2010 Art Trail. This year everybody chipped in again and I was able to design and have printed an oversized postcard as well as a 2-fold brochure with a map on one side. My husband created the map, which was a wonderful contribution on his part. A problem our artists have run into with attempts at the art trail in our county in the past is that the county is so large and everything is so spread out because of all the farm land and sparse population that only a handful of people, if that, would travel the art trail. That was very discouraging to any participants. Last year my husband and I volunteered to have several artists set up tents at our place so that visitors could see more artists with less driving time. Other members of the group followed suit and we ended up with four locations where visitors could see multiple artists. We do this trail as a part of the larger event in our county, sponsored by GoArt!, called The Artist Road Show, which includes not only members of our group but other artists in the county who are not members. By creating our own trail (I will call our portion the “Artists of The Oak Loop” within the larger trail, we are able to create our own promo materials in whatever quantity we desire and get them out much earlier than the GoArt! materials get out. This gives us a greater chance of attracting as many visitors as possible through our own resources and efforts while also allowing us to benefit from the larger reach and budget of GoArt!’s promotional actions. It must have worked last year, because attendance was about ten times what it had been in previous years (keep in mind that in previous years it had been literally three people who traveled the trail and last year we had about forty people who came through). This year, we plan to have even more and to keep increasing the numbers every year by getting better at promoting it. If you live in the area, set the date aside and travel our trail. It will be a beautiful day, a wonderful opportunity to meet some very talented and interesting artists, and there will be opportunities to begin or add to your own art collection. We will all be making an effort to have some smaller, more affordable pieces available for anywhere from $20 to $100 along with more expensive pieces as well. For those of you who do not live in the area, our county is a wonderful place to come to the country for a drive. We have an abundant supply of farm stands with ripe, tasty local produce at amazing prices, Lake Ontario is simply beautiful to drive along, the Oak Orchard River has world-class fishing opportunities (we are right on that river), and there is our wonderful art trail. If you enjoy my art in particular, Zambistro restaurant opens at 4:00 p.m. on Saturdays with a delicious comforting menu of affordable gourmet food plus their walls are adorned with plenty of my paintings. You can download a map for Artists of The Oak Loop here. Meanwhile, back to what is happening today on the farm. Among the many annuals I planted in all of those old, rusty containers there is this lovely beauty … my new favorite begonia. Begonias have been my very favorite potted garden flowers since I was very young, in fact, my first potted flower I ever owned was a begonia. There is something deliciously old-fashioned about a begonia and this one is particularly lovely in my eyes. I love the bright yellow, over-sized flowers and the big rustic looking leaves. They grow and grow, and bloom and bloom all summer long and I just love them to pieces. This one looks especially wonderful set against the deep rusty color of the old container I planted it in. I met this variety of begonia for the first time last summer, and we became fast friends. Last year we planted two peach trees, one Honey Crisp apple tree, and a cherry tree. While the cherry and apple trees did not bear fruit yet, the peach trees have lovely little peaches that are coming along quite beautifully. There are about two dozen peaches between the two trees and we really look forward to sinking our teeth into them by the end of the summer … a long wait, but well worth the patience that will be required. There is something very profound (to me) in looking at a something we planted that has grown and is bearing food of some kind. When we grew pumpkins a couple of years back we all loved going out every day and watching the progress of the orange orbs as they multiplied and grew. Our “Sincere Pumpkin Patch” sign is still standing guard over that hallowed ground, and we will be putting in a few pumpkin plants shortly. Our little project to start 36 pumpkin plant in six different varieties indoors this year was a disaster, so I had to ask my Lora P. to start a few for me in hopes they would have a better chance of survival under her care — she is a real farmer, I just live on a farm and fantasize unrealistically about growing all manner of flowers and produce. That having been said, we did have an opportunity this past weekend to feel like real farmers for a few hours. The farmer who works out fields was out plowing and planting all weekend, and while he was doing that we had to rake the three acres of lawn around the house and barn. This year we had so much rain, so constantly, during the spring that the yard stayed too wet for my husband to be able to get out on it with his tractor and keep it mowed. As a result, the grass grew too long between mowing, and that left a problem of far too much long, dead grass laying about on the lawn. We had to rake it up in order to keep our “grass” green (it is actually a mixture of some grass and many very green weeds of various varieties). We raked Saturday and Sunday, making large piles of dry grass all over the place. Looking at them, though they were not formed into “stacks”, they looked like mini versions of hay stacks to us and that was enough for my imagination to get going for a time. On Sunday, my husband rigged up a large shovel type contraption that he hooked to the front of his tractor for loading the dead grass piles into so he could drive them over to a different area of the property. This shovel thing he made was about eight feet wide, and maybe three or four feet high — it was pretty cool, and I love it that he is clever and resourceful. We made our way from grass pile to grass pile raking big piles of grass into his huge shovel and packing it down. Doing this while the farmer was working the fields, I told my husband that it almost felt as if we were real farmers. Silly really, because real farmers work very long hard hours day after day after day, whereas we worked for a few hours two days in a row and all we were doing in reality was getting rid of grass. No pun intended, but we have covered a lot of ground today. There is one more item I would like to share in parting though … I wrote a press release this week for my son’s Etsy store and we are getting it out to various media contacts and bloggers. If you are a blogger and would like access to the press release, you can find it here. 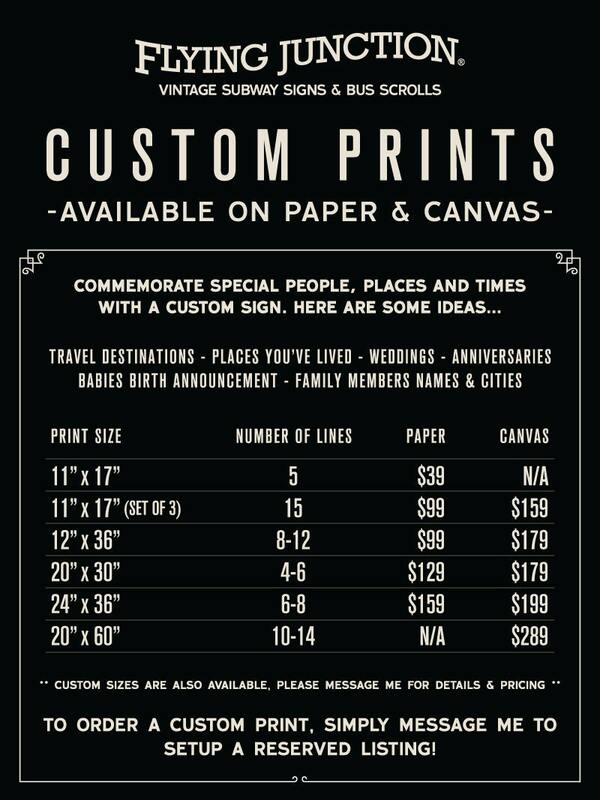 Here also is a graphic he just started using in the store to help give people ideas about custom signs he could do for them–click on the graphic to see the full size image (so you can read the wording). I plan on having him create a custom sign for I Live on a Farm, to track our journey and commemorate the fifth anniversary of our marriage and the blog. It seems appropriate right now, because we are on the verge of some very exciting new developments. I can sense, just as I did six years ago, that some important, positive changes are in the air and heading our way. Well, I have much to do. Strawberries are in season, and I need to go buy a bunch of them so I can make my annual huge batch of strawberry rhubarb preserves. And that is just the very, very tip of the iceberg for summer activities around here. Your writings are always an enrichment “of my soul”! And the richness of colors in your photographs is “breathtaking”! endeavors and all you share with us!!! What a fantastic blog, with all the news and pictures. What a wonderful life to live on a farm, not be farmers but doing so much with plants, trees and flowers. And then there is the art! Wow!What an adventure! I love it all and am reminded of growing up on a farm in North Carolina. The river and the swans are a wonderful addition to the farm. I love it all. Thank you so much! Thanks! Your descriptions are always so beautiful. I wish I could be there for your Art Trail but will forward to friends and family in NY. I love the fact that you’re blogging on a more regular basis these days despite your busy-ness. I always enjoy hearing about what’s happening around the corner from me….